“This shocking abuse of democratic process of the European arrest warrant system by Spain is intolerable and should be resisted by Scotland’s courts and government. “Can we imagine the British government handing over Sergei Skripal to Moscow on a European arrest warrant if Russia was part of the EU? Or London handing over the war-time Polish government-in-exile in London to the Nazis? 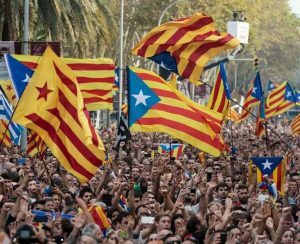 “This move by Spain is a sinister ploy to circumvent the democratically-expressed vote in favour of Catalonian Independence – and let us not forget Spain is a ‘fellow-EU’ nation that was prompted by the British Government in the Scottish Independence referendum to groundlessly claim that Scotland could not be an independent member of the European Union. “Cynically, the best SNP leader Nicola Sturgeon can hope for here is that Clara Ponsati seeks political asylum in the Ecuadorian embassy in Edinburgh – like the Wikileaks whistle-blower Julian Assange – and takes the European arrest warrant out of her in-box. “Sedition is not a criminal offence and you have to show dual criminality so if extradition takes place it has to be an offence both in the requesting state and in the requested state i.e. Scotland. Scotland’s Independence Referendum Party is not competing with the SNP; rather, we want to work in a progressive alliance with them.